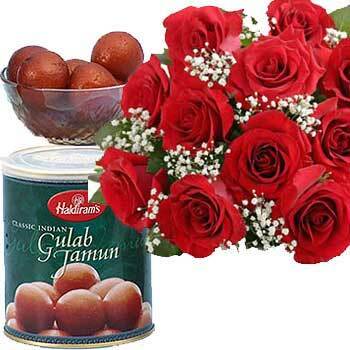 Send this hamper to your dear ones in India.12 Red Roses and 1Kg Gulab jamun.We offer a variety of bouquets, flower baskets and gift hampers for every occasion. Our Sweet Hamper is especially designed for festivals; it comprises of a bouquet of red roses and a tin pack of 1 kg Gulab jamun. Our expert florist has arranged one dozen red roses with greens and fillers elegantly in a bouquet. 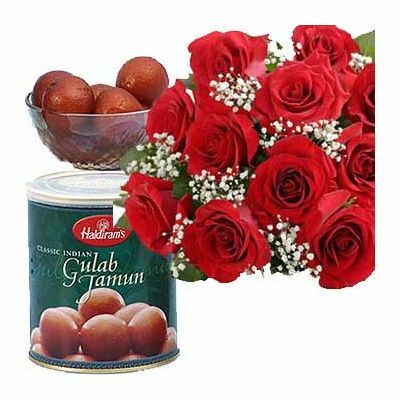 Send roses bouquet online, our fragrant blooming roses together with fresh gulab jamun will double the joy of any occasion. Our Sweet Hamper makes an excellent gift for festivals and you can also send them on happy occasions such as weddings, anniversary, and birthday, birth of a child and as a thank you gift to your dear ones in India. We offer home delivery service, and same day delivery service.